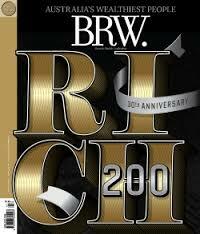 Next week marks the final edition of the BRW as a printed magazine – another defining moment in the ruthless evolution of the media in the wonderful and terrible world of the internet. I’m sad that the another generation of journalist will not have the incredible experience I was so privileged to enjoy – 15 years of writing carefully-researched stories to the most demanding standards of any publication around the globe, the chance to engage with thousands of brilliant minds, and to be part of a community of effort to re-invent and celebrate all the creativity and innovation that business can deliver at its best. It was also a time when we were backed by our editors to research and write the tough stories, the investigations into crooked business dealings, shoddy or corrupt leadership, mismanagement, and rubbish government regulation. I’m so lucky to have had the opportunity to write stories, day in and day out, because writing is what I love to do. It’s a playground in which, even if the game isn’t going my way, I can always think of another possibility, another idea that might – and usually does — set things right again. If you have a good idea, write it quickly or someone else will. Ideas seem to float in the ether and find their way to the first free and willing pair of hands. If you don’t understand something, don’t write about it until you do. Go back to the drawing board, ask more questions, spend more time, ask more colleagues, do more research. Sub-editors save you from wide-spread public humiliation and so, even though they are horribly pedantic, love them. Check figures, and especially make sure that a string of percentages add up to 100%. Learn how to ask “how much” in a lot of different ways. When people decline an interview, keep an eye on them. There’s usually a good story in the background that they don’t want you to know about. When people approach you to write a story about their success, wait. They are usually broke a few months later. Have a mentor, and be a mentor to an upcoming journalist. Journalism is learned on the job over many years. Be willing to keep learning and to keep sharing what you have learned.